The Moss Melton Family: Go Cardinals!! Well tomorrow is the Super Bowl. Ainsley will be watching it with her boyfriend Miller and I am sure we will get some great pics. Thinking about the Steelers in another Super Bowl is depressing. Cleveland Browns fans HATE the Pittsburgh Steelers! They are the number one rival of our poor Browns who will one day go on to win the Super Bowl. So GO CARDINALS!!!! I had to post pictures from the Cleveland Browns game Moss went to the Sunday before Christmas. For those of you who have never been to northeast Ohio in the dead of winter, you can see it is mighty cold! 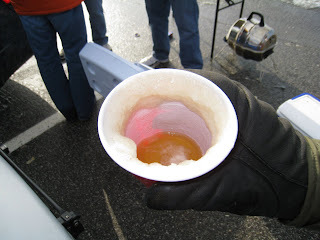 The temperature with wind chill was below zero at the game. 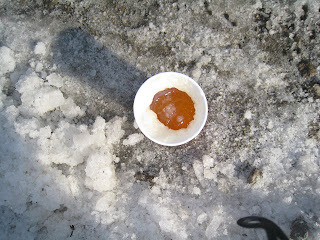 So cold that the beer turned to slush a few minutes after it was poured. Moss said that when that wind would whip off the lake and blow the foam off the beer, the foam would turn to ice particles. Before we went to the Browns/Steelers game back in 2005 I had told Moss it would be cold unlike anything he had ever felt before - that game ended up being 65 degrees! He has never let me or my family forget that so we were all thrilled he finally got to experience one of the coldest games in recent Browns history. 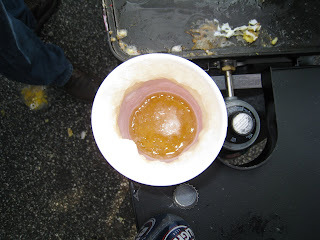 Here are some pics of the "beer margaritas." 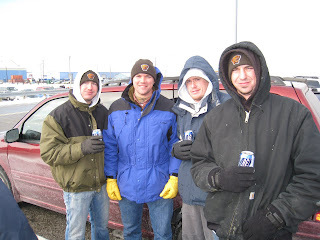 My brother Todd, Moss, brother-in-law Ben and my brother Alex freezing at the game - they left at halftime to watch from the warmth of a local bar. They didn't miss much since the Browns didn't even score that whole game! I can't believe what we are sitting here watching on tv!! I know you and all the Cleveland folks are sick at your stomach! BOOOOO Steelers.. OH well, it's just a game I suppose. I in the meantime have succeeded in changing my background while watching the game! Thanks for the great link hook up! You will really enjoy blogging. Like Lisa D said.. it's therapeutic for me no doubt and very much a scrapbook tool to keep up with what our busy lives entail. Love you and have a great week!